The Locust performance framework provides handy monitoring of scripts in both GUI and non-GUI modes. But the out-of-the box GUI monitoring has a few drawbacks. First of all, its web UI reporting is not customizable. Of course, you can try to dive into the Locust source code and make your own custom Locust version. But in such a case, you break compatibility with the main version and it might bring difficulties as soon as you want to update Locust to a newer version afterwards. Also, it is worth mentioning that this approach is usually quite time-consuming unless you are a Python expert. In addition to that, the Locust web interface provides you with a nice way to monitor results, but it doesn’t enable storing the web-presented metrics, for comparison with future results. Yes, you can take screenshots. Yes, you can create a pdf from the results page. But all of this requires a lot of additional effort and manual interactions, and gives you only static metrics, which you can not play with later. In this article, we are going to show you one of the ways to monitor Locust scripts, save important metrics into a time-series database (to keep them stored for future comparison) and present all this useful data on outstanding real-time dashboards. Also, as you might notice in the article name, you can do this in just 15 minutes! Sounds intriguing? Let’s go then! In the past few years we are experiencing a strong displacement of the way we deal with the installation of additional tools and systems that help our development processes. Now, almost all these tools can be installed and configured in just a few minutes by using Docker and other virtualization/containerization technologies. If you need to setup a separate database or monitoring dashboard, it doesn’t make sense to spend many hours trying to install all prerequisites required for this additional tool, or investigating how you can apply additional configurations inside the tool. Nowadays, you can easily find the Docker image that already gives you the container with the tool or even with a combination of different tools that you probably need to install for the integration. In this case, you don’t even need to spend any time to integrate one tool with another. We are also not going to waste time and we will just use an existing container that allows us to install the whole environment that can collect and show Locust performance metrics. All you need to proceed with the steps mentioned below is to install the Docker application with the ‘docker compose’ extension. I’m pretty sure that you have already installed it, as it saves so much time and helps you to focus on the main tasks instead of spending time on tools installation and configuration. But if for some reason you still don’t have Docker installed on your machine, feel free to use this link and the proper section based on your current OS. As soon as you have Docker installed, you are good to go! 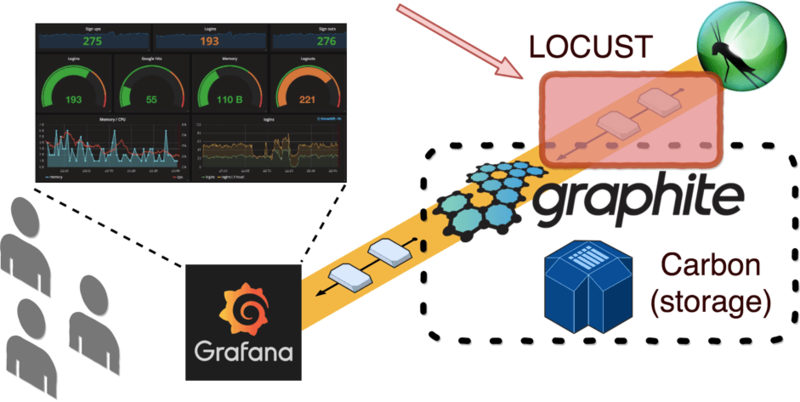 Grafana is one of the best dashboard applications for monitoring and analytics. It provides you with very robust dashboards that have hundreds of components for building very detailed monitoring. Also, it gives you an opportunity to perform different analytics on top of your data, drawing any combination of metrics and even some computing formulas based on your business goals. It is very often used as a company standard and maybe you don’t even need to proceed with installation steps if it is applicable to your company as well. However, do not worry if it is not. We will show you some tips explaining how you can spin up the Grafana dashboard on your laptop in just 5 minutes. However, the main reason we want to use an additional monitoring tool is that we want to collect metrics and keep them as historical data. Metrics collected from performance testing tools are represented by time series data points. Each data point has a timestamp displaying when the metric came out, the metric name (e.g.response time or response length) and the metric value (e.g., 100 ms or 1MB). Obviously, we need a place to store this type of data. Fortunately, there are already many data storage tools to achieve this goal and such a storage type is called time series database. There are many time series databases available in open source and each one has different advantages and drawbacks. We are not going to concentrate on the choice process between them because that is worth a separate article. 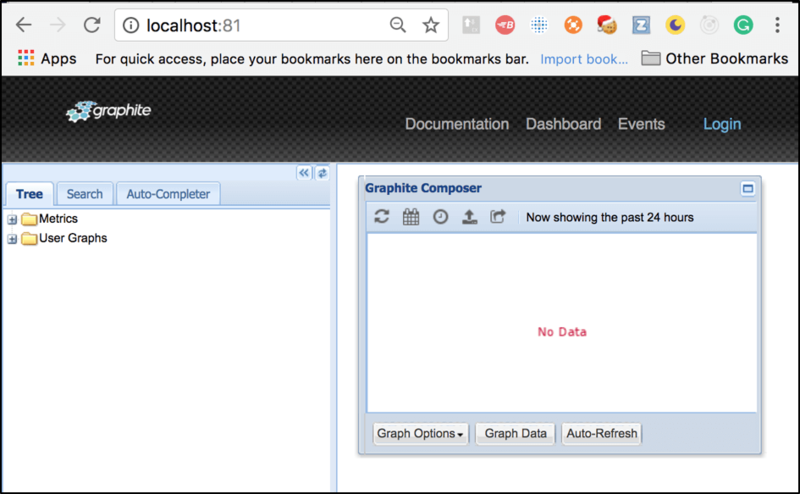 We will stop our choosing process on the Graphite tool, because it is one of the most famous open-source tools that is usually used in combination with Grafana, and it provides a simple database storage to keep time-series data, called Carbon. Graphite is used by many worldwide companies so you don’t need to worry about long-term support and that it might become outdated anytime soon. So now we came up with a combination of two different tools that can be used in integration, and together provide a handy way to store and draw our performance testing metrics. They also have the ability to perform additional analytics on top of this data. Now we are ready for the easiest part - installation. At this point, we are interested mostly in Grafana and Graphite and this integration has both. If you don’t find a need for the rest of tools, this Docker file can be easily edited to remove those. But we should not care about it right now as these additional tools do not take many resources and will run silently in parallel without impacting our main reporting workflow. Surprisingly, that’s it. The installation has been completed and now you are running this batch of these tools on your local machine! 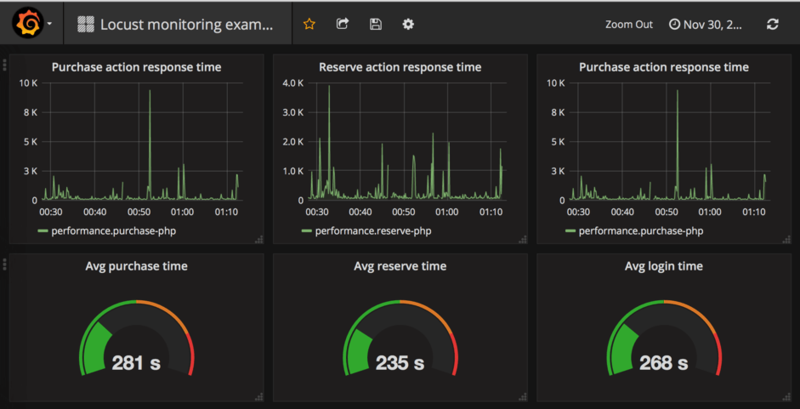 With the help of Docker and the appropriate Dockerfile, we just setup the whole basic infrastructure that is required to start monitoring your Locust performance scripts in Grafana. Carbon will automatically handle this plain text and convert it into a metric. Now we know the type of data that we can transport from the Locust script to Carbon. But what about the communication layer? For communication and data transport you can use a simple socket that allows communication between two different processes on either the same or different machines from the same network. By default, Carbon provides the 2003 port that can be used for incoming socket connections. Now we know how and what we are going to send. So, the easiest part remains. Let’s implement metrics reporting from Locust by using a socket connection to Carbon. The last two values seem obvious but the first one requires an explanation. In order to group our metrics inside Graphite, we need to use a unique prefix. This prefix might be any string you want and we chose “performance.”. Dot symbols are reserved and used in Graphite (Carbon) to separate metric levels. That’s why we added name.replace('. ', '-'), because our request name might contain some dots and we do not necessarily want to split request names into different levels. In this case, we just use another separator for that. 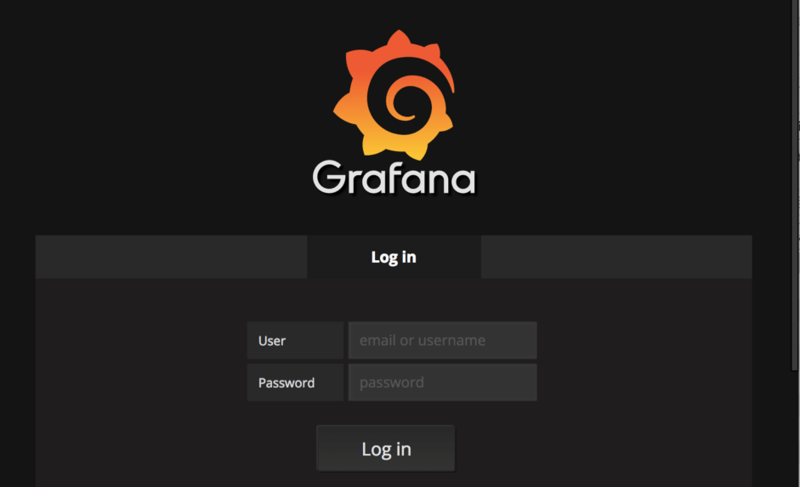 Now we know that our data is in place and we can implement some cool dashboards in Grafana! 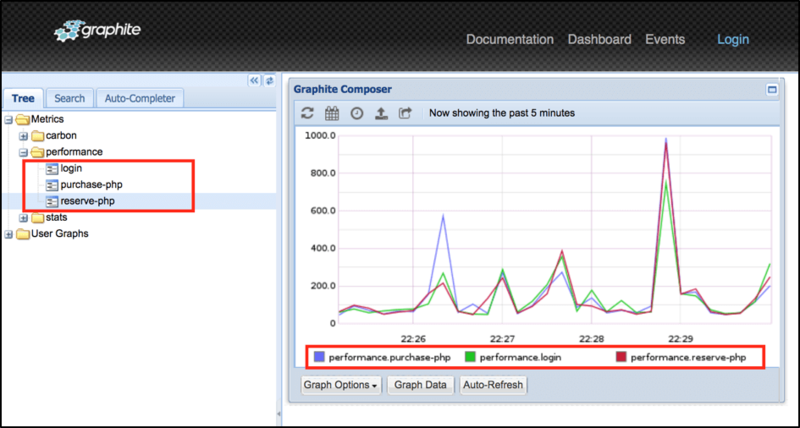 This a basic dashboard that contains information regarding response time for our tested endpoints. Using powerful Grafana capabilities you can add additional analytical elements to calculate average, minimum, maximum time and much more. 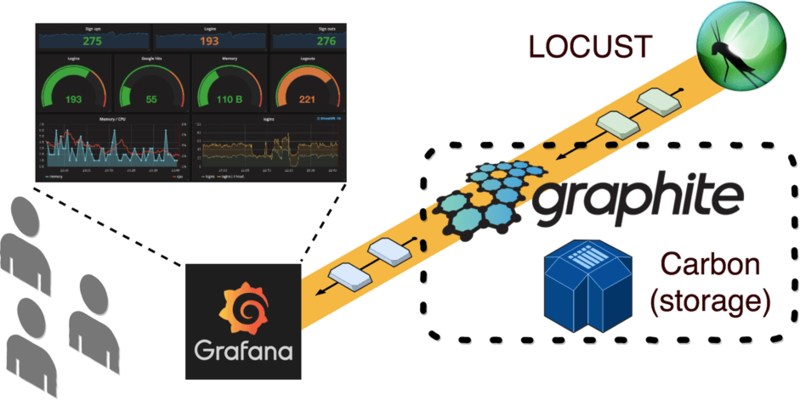 I hope that we gave you the main idea which you can use to monitor your Locust scripts in Grafana. Let us know which tools you prefer to monitor your performance scripts because detailed and comprehensive monitoring makes the job of performance test engineers awesome! Run your Locust tests with BlazeMeter! Get scalability, multiple geo-locations and advanced reporting. To learn more, request a demo. Or, put your URL in the box below and your test will start in minutes.